So, I tend to look at the entire endurance process as one big training opportunity that’s all building up to my eventual go at Tevis. Today, I practiced getting up early. I was up at 3:30, dressed in my riding gear, drank my coffee and a (pre-made) breakfast smoothie, and was out the door by 4:00. 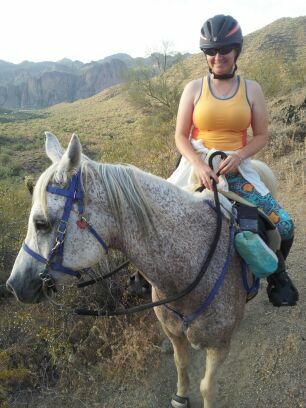 I met up to ride with my friend Lancette, and she brought her horse Khan for me to ride. I realize at this point that my readers have probably given up trying to track all of the different grey horses I’ve been riding of late. It’s okay. I can barely keep track myself. 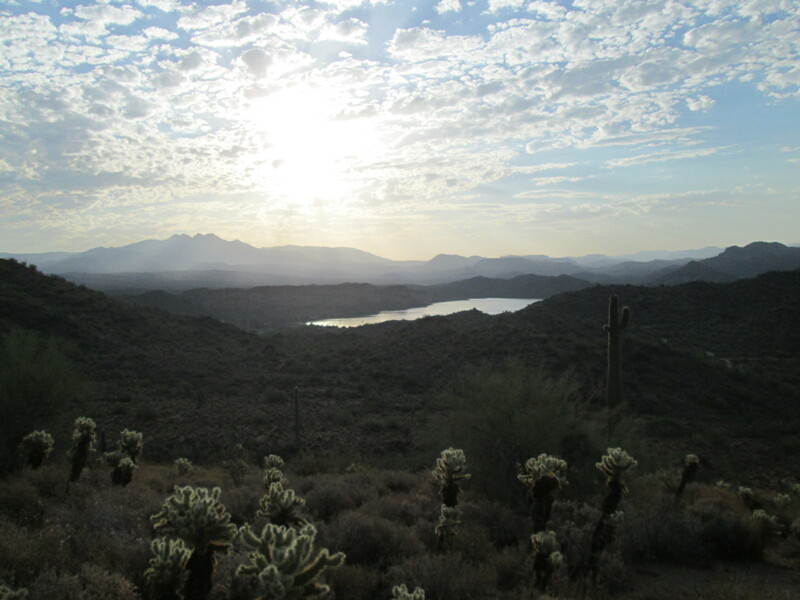 Our destination: the Stewart Mountain Loop by the Salt River near Saguaro Lake. 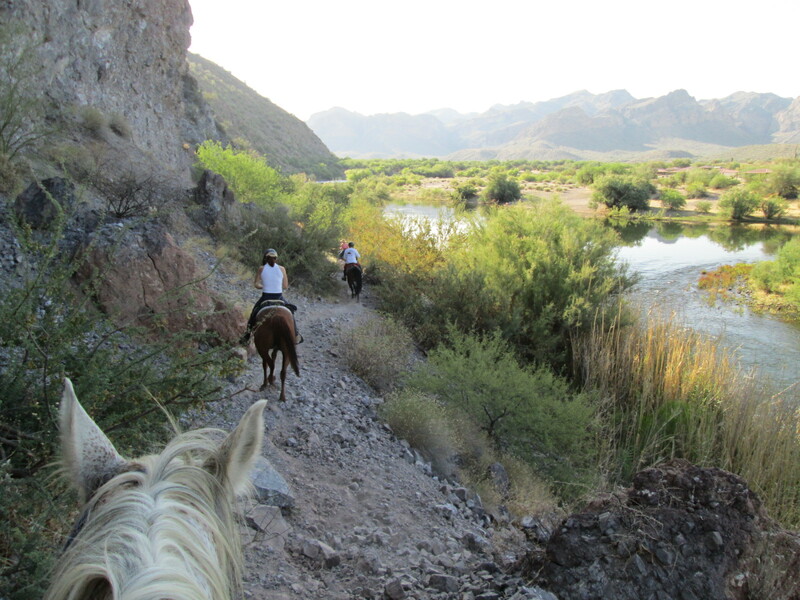 I’d ridden this loop years and years ago on Mimi with some friends, but to be honest, the only part I really remembered was the area that’s like a sandy beach and provides easy river access for horses. 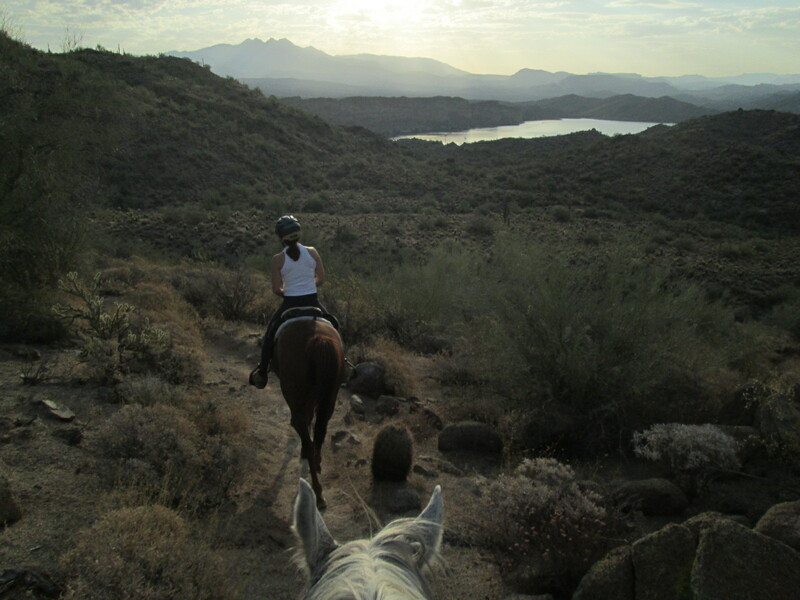 I also remembered the part that goes up to a ridgeline and gives a great view of Saguaro Lake for a bit — this section I’d last ridden just a couple of years ago. Because it’s a loop, the trail can be done in either direction. We chose the way that meant getting the longer section done first and getting to the river towards the end of the ride, when we’d be hot and sweaty and the cooler riverfront section of the trail would feel really good. 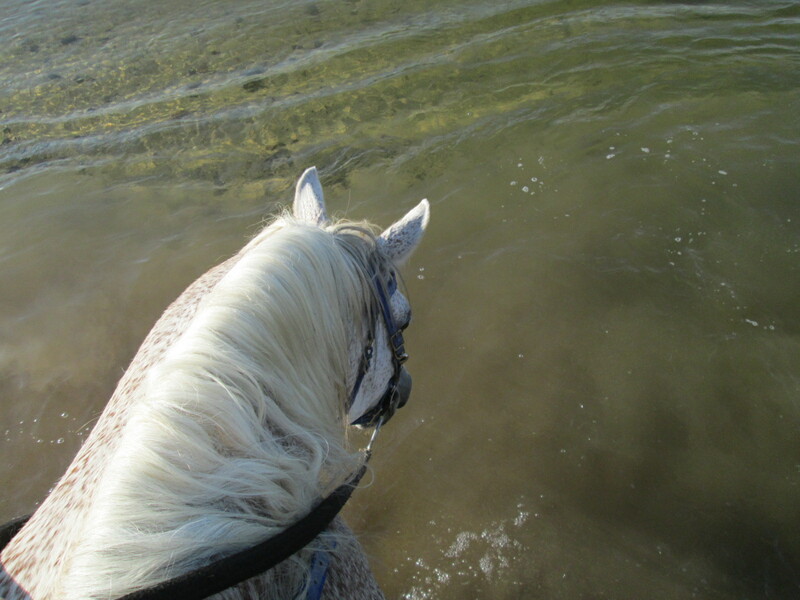 The spot on the river that’s easily accessible for horses is a nice sandy mini-beach, and the water is slow-moving and clear enough that it’s easy to see how far the sandbar goes out into the water before the drop-off starts. We didn’t go any further in than knee-deep, but that was enough for Khan to have a great time splashing and pawing the water. He never tried to roll, but he figured out that pawing the water made it splash up onto his belly and chest. I wasn’t complaining about the overspray, either. Running the loop the way we did, counter-clockwise, the trail that heads back to the trailers from the river is this fantastic section of technical single-track. There are a couple of slightly “hairy” areas that involve a bit of clambering over some rocky outcroppings. The whole trail traverses the area between a vertical cliff and the river, and while you’d probably still be in one piece if you fell off the trail at that point, it definitely wouldn’t feel good. 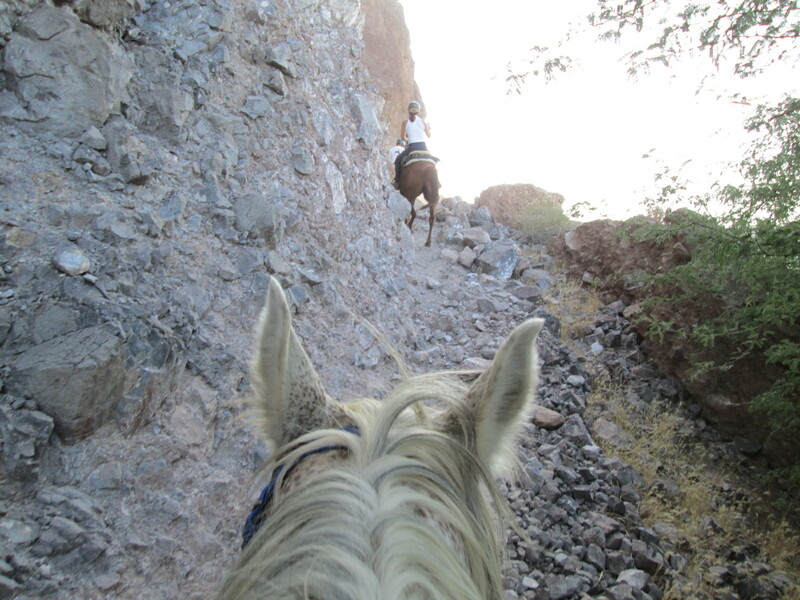 Fortunately Khan is very experienced and has a lot of trail savvy, and never put a hoof wrong. So much so that I whipped out my camera and was happily snapping away, putting it away only through the worst of the rocky sections that required two hands and ride attention. I wish more of the trail ran along the river, but all too soon we were back out in the desert, and back to the trailers. The loop is just about 8 miles, and we covered it in about two and a half hours. 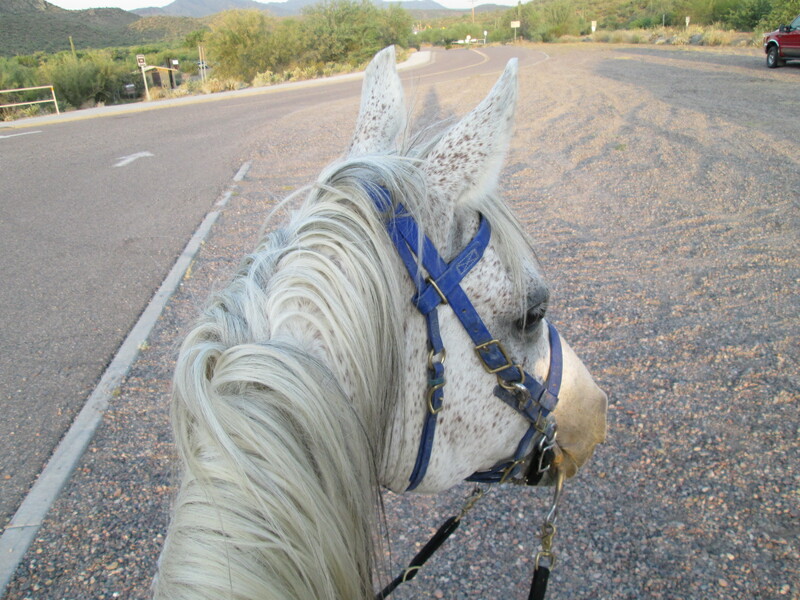 We were out for an enjoyable ride, with only one of the four horses in our group in full competition shape, so it was a good day to take it easy and enjoy the trail. Khan was a fantastic ride — very sweet, happy to go, cooperative, and darn near unflappable, the kind of horse who is trustworthy with the greenest of beginner, but a smart and active ride for an advanced rider. 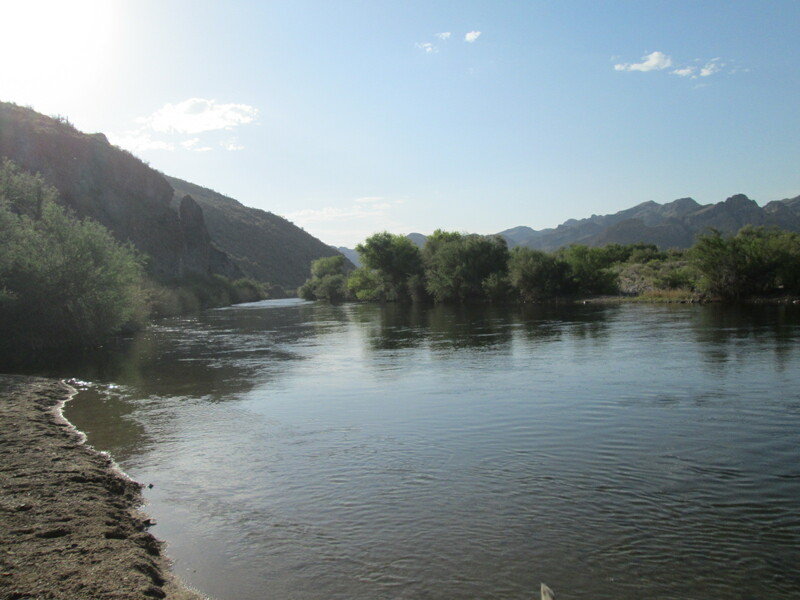 I love that area around the Salt River. 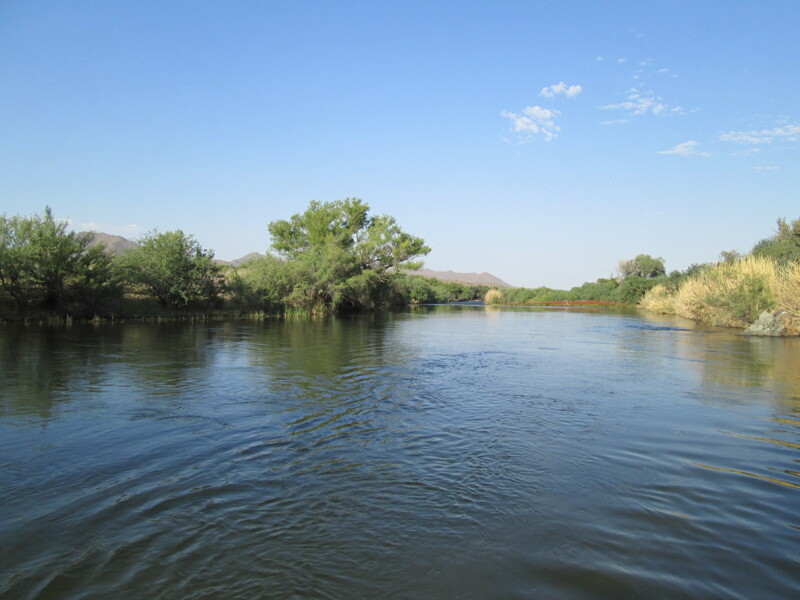 It’s definitely an oasis in the middle of the desert, and a real treat for us otherwise parched desert rats. Makes the hot days a little more bearable, and the early morning wake-ups worth it. I love the gorgeous scenery! It looks like a beautiful ride! That trail looks a little scary to me. Really beautiful! You and Khan look great.